When a virtual world veteran visits Blue Mars for the very first time, she usually notices a surprising and sometimes eerie thing: Her avatar seems to look right at her. This happens not just when the user's camera is positioned right in front of the avatar, but even when the avatar is facing away. It will sometimes just turn around and seem to look right at you -- as if to say, "Don't you wish you were here instead of me?" 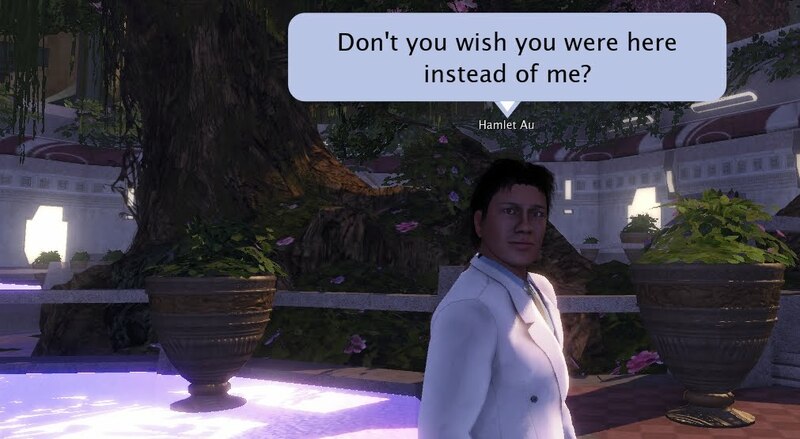 (At least that's what I imagine my Hamlet Au avatar thinking, when he turns back to stare at me.) As it happens, this is an intentional design decision by Avatar Reality developer Koji Nagashima, who's created 3D characters for both videogames and movies. "I think direction of eyes is very important point to make the avatar 'alive'," Koji tells me. Before joining Avatar Reality, he was Cinematic Character/Simulation Technical Director for the hit videogame franchise God of War 1/2 (among other titles), and before that, senior programmer for 2001's groundbreaking CGI movie Final Fantasy: The Spirits Within, which brought the first photorealistic 3D characters to the big screen. However, the problems are somewhat different, when you're conveying believability in a virtual world. "On a cinematic project," Koji explains, "all animators carefully make animation for eyes. But in our world, the program needs to take care of that." Eye animation in a virtual world or MMO is challenging because the avatar's position or the user's camera changes so often. "That's very interesting for me," Koji says. His solution was to make the avatar respond relative to the position of the camera: "When the camera is just in front of the avatar, he keeps looking at the camera." When the camera is to the side of the avatar, he looks less at the user. And to convey a sense of autonomy, when the player rotates the camera, the avatar's gaze starts following it. All this is in service of breathing life into Blue Mars avatars, but Koji Nagashima isn't finished. He's tweaking some issues with the avatar's gaze, and in the future, he wants the eye contact to reflect the avatar's personality: For example, active avatars will look at the camera much more often, while shy avatars will largely avoid the camera's gaze. "Something like that," Koji says. "That's a future aim." Update, 12/1: Fixed Koji's credit from Medal of Honor: South Pacific to God of War 1/2 -- which is, in any case, the bigger game! I think the acknowledgement of the camera breaks immersion in Blue Mars. It reminds me more of a stalker situation. The avatars are projections of the visitor to Blue Mars. They are no longer Koji's personal play toys after the user personalizes them. He should remember that. With all this concern with eyes, the BM team should work to make them look a bit better. They still have that dead fish glare, even with a professional reskin purchased for them. Actually, having the avatar look directly out of the screen is very handy for taking photographs, and it is not as if this occurs 100% of the time. I don't want to argue about 'breaking the immersion' - that is purely a psychological position and the day I start worrying about my avatar looking at me is the day they should come for me in the white van. We all have personal preferences, I guess, but it seems unfair to assume that because a developer's choices did not concur with ours, then the developer has failed to remember something. Having an avatar constantly look at the camera breaks the 4th wall. It is no longer a projection of the user but becomes something other. SL manages the screenshots fine without the avatars staring at the camera view. Camera view just highlights the BM avatars Uncanny Valley problem. The eyes, I can't say it enough, they are wrong. And the same problem was in "Final Fantasy: The Spirits Within". If it can't be fixed with technology at the moment then work around it. Don't try for realism, it just makes it more creepy. I find it creepy when the avatar looks at me. The avatar is supposed to *be* me in the world. When it looks *at* me, that is as if it's someone else, not me. It breaks my identification with the character.